When Toyota and Subaru joined together to build the new BRZ / Scion FR-S / Toyota GT 86, we didn’t know how successful the partnership was going to be. But in the past year, the rear-drive two-door sports cars have received more praise that just about any car on the planet. Now, the Subaru BRZ and Scion FR-S are getting more praise and have been named Automobile Magazines All-Stars for the leading automotive publication’s annual list. What does this latest recognition say about the sports cars? To be an ALL-Star for Automobile Magazine, it’s similar to making the Major League baseball All Star team. You have to be the best in the field. To earn this spot, industry judges evaluated the BRZ / FR-S against all current model year vehicles on sale in the United States across all categories. In naming the sports coupe, Automobile Magazine highlighted the rear-wheel sport car’s engaging driving experience and accessibility. Automobile Magazine took the sports car out on the track since this is where many buyers will enjoy the rear-drive coupe on weekends. Many people are saying the sports car is dead because of the economic and environmental landscape, but that couldn’t be further from the truth. Automobile Magazine said, “The whole sports car thing began simply as a description of a car that could be used for competition on the track as well as for daily use on the road.” So they took the BRZ / Scion FR-S to the track. Many automakers use their performance cars to sell their everyday drivers and commuters. “These cars are part of a wave of high-performance sportsters that are coming from automakers in every country, as high performance has become an accepted approach to marketing and selling significant numbers of street cars.” The team took the cars to Chuckwalla Valley Raceway in Desert Center, California, in the middle of the Mojave Desert. It’s one of the most remote racetracks in the United States. This was the perfect environment to test the two rear-drive sport coupes. The Automobile Magazine drivers found they liked the sticker price of the new sports car. The driving dynamics were a pleasant surprise and the team even compared it to the WRX. They said, “This car steers much like an all-wheel-drive Subaru Impreza WRX, which is to say that the front tires feel like they're doing a lot of work. We think this makes the BRZ safe and controllable for most drivers, even if it's less lively than the Scion FR-S.” The BRZ / FR-S has driving dynamics similar to much more expensive sports cars due to the low center of gravity. This is due to the Subaru Boxer engine that sits low in the chassis. The combination produces a great driving experience. When it comes right down to it, car enthusiasts might hype the expensive German sports car, but simple affordability is an essential ingredient to sports car success. At a starting price of $26,265, Automobile Magazine says the Subaru gets on a lot more shopping lists than a BMW 128i. They make a great point in that price and a fun driving experience is all a driver needs. 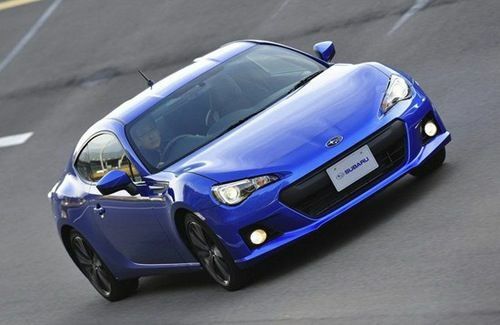 The new Subaru BRZ and Scion FR-S has already had an enormous influence in the auto world.